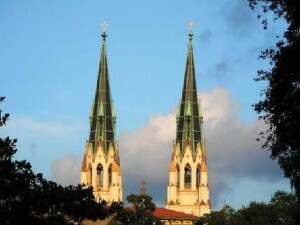 The Cathedral of St. John the Baptist is an iconic symbol of Savannah, Georgia, gracing the skyline with its towering steeples – a view valued by our residents and visitors alike. The Cathedral represents historically noteworthy architecture as well as over a century of faith and civic traditions in Savannah. A Preservation Endowment Fund was established to move beyond the history of remedial repairs funded by debt. This Fund leads to a future of less-costly conservation and preservation paid with the investment returns of a body of funds specifically dedicated solely to those purposes. Volunteers are needed to assist with clerical duties- stuffing envelopes, mailings- as well as making phone calls. You can volunteer when it is convenient for you. This is a very rewarding ministry as you help with the preservation of the Cathedral for you, your family, and future generations. If you are interested, please complete the form. Each year, the Cathedral engages in fund development activities, such as the Preservation Society, to grow the Endowment Fund.